This is a highly enjoyable disc containing expert transfers of historical recordings made in the early 1950s. The transfers have been made not from the original tapes, but from long-playing records. The Mendelssohn D minor Violin Concerto for soloist and strings was not rediscovered until 1951. It had been bought from an antiquarian by Menuhin himself who also edited the manuscript and had it published, giving the first performance in New York on 4th February 1952. The present recording was made two days later with the same string players. Although written when Mendelssohn was only 13 years old it is an endearing piece, which obviously appealed enormously to Menuhin, who, like Mendelssohn, had been a child prodigy. In his early works, Mendelssohn�s string writing was greatly influenced by Bach and his offspring, especially C.P.E. Bach. Although this is an early LP recording, the aural dimension is excellent with great clarity of string sound. Menuhin plays the solo part with real feeling and insight. I particularly liked the warmth and candour of the second movement Andante. True to the original 1952 issue, this Naxos disc also includes the much better-known Violin Concerto in E minor. This recording was made in Berlin with the Berlin Philharmonic Orchestra under their erstwhile chief conductor Furtwängler. It is pertinent to remember that Furtwängler remained loyal to the Nazi regime from the rise of Hitler in the 1930s and throughout the Second World War. There was thus a much needed period of rehabilitation following the war which eventually allowed his return to the international musical stage. Menuhin, himself a Jew, did much to help Furtwängler re-establish himself and it is rather poignant that this recording should be of Mendelssohn. Given that the Jewish composer had been vilified by the Nazi regime to the extent that his music was banned and his statue had been removed from the square in Leipzig opposite the Gewandhaus. The violin-playing in this recording is exemplary but I found that the orchestral accompaniment was heavy and lugubrious. This is not helped by the rather heavy string sound which tends to weigh the work down to a certain extent, especially during the outer movements. The last work on this disc is the Bruch Violin Concerto No. 1 and is the third recording that Menuhin made of the piece. Interestingly Elgar used his first recording of the Bruch, made at the age of 15 in 1931, to evaluate Menuhin's expertise as a violinist in preparation for their historic recording of Elgar's own Violin Concerto in 1932. 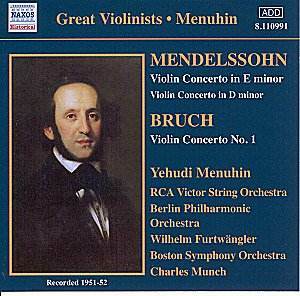 The recording on this disc was made in 1951 in Boston and is the only recording that Menuhin made with Charles Munch and the Boston Symphony Orchestra. Despite the fact that the recording is only a year older than the other two on this disc, the sound is notably inferior - particularly that of the orchestra, which sounds constricted, distant and has a boxy acoustic. The violin solo is very prominent and, not surprisingly, most beautifully played by Menuhin, a great exponent of the work. The second movement is just ravishing! My only criticism is that the last movement is played at a somewhat measured tread, not really the energico specified by the composer. There are countless couplings of the Mendelssohn and Bruch Violin concertos in the catalogues and it would be impossible for me to recommend a best buy. This disc cannot compete with � or replace - modern recordings, but rather gives us an insight into the early recordings of possibly the greatest violinist of the mid-20th century. The skilful and silent transfers, despite some shortcomings in orchestral sound, are impeccable and allow us to evaluate Menuhin�s greatness without having the swishes and clicks which bedevil some historic pre-LP transfers. The inclusion of the early Concerto in D minor is a useful and fascinating bonus. A must-have for Menuhin enthusiasts!